Although house of Maikapar belongs to urban apartment buildings, the outer look, spatial disposition and - the main - the use of it makes it similar to palaces. In 1931 the owner of the house became manufacturer of tobacco S.Maikapar - Karaim by nationality - and he rebuilt the building in the same year after the design of A.Trofimov in its present day shape. In this stylish building there was located embassy of Great Britain and apartments of ambassador in 1920ies and 1930ies. For a while Maikapar himself lived in the second floor of the building but in the first floor there was club for workers of Maikapar factory. In 1941 there were repairs in the building to accomodate it for the planned museum of Rainis. War discontinued this project. During the Second world war and German occupation in this building there was located the main eldest commisar of Riga H.Vitrock, but after the end of Second World war as the Soviet occupation started - head of Baltic Military District I.Bagramyan. Late here were arranged representative premises for the Council of Ministers of Latvian SSR and premises for reception of high guests. In this building there have stayed N.Khruschchev, J.Broz Tito, J.Neru. At the independence of the Republic of latvia was renewed the house was inherited by banker Aleksandrs Lavents. In 1990ies, when Riga castle was in repair he rented it out to the president of Latvia G.Ulmanis. In late 1990ies owner of the building was enterprise "Ventspils nafta" which also used it for representation purposes. In 2001 there was completed reconstruction of the building (A.Spaks, L.Biseniece, G.Martirova, K.Abike, D.Berzina) - as a result of these works there were adorned also interiors of the building which were comparatively simple before. 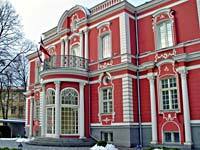 At the beginning of 21st century the building served as a residence of state presdent V.Vike-Freiberga. Currently (2009) the building is property of the enterprise "Latvijas kugnieciba" belonging to the group of enterprises of "Ventspils nafta". Krastiņš J. Eklektisms Rīgas arhitektūrā, Rīga, 1988, p.11. Enciklopēdija Rīgas ielas, 1.sējums, Rīga, 2001, p.172. Krastiņš J., Strautmanis I. Lielais Rīgas arhitektūras ceļvedis. Rīga, Puse. p.281.